Former Phoenix intern Adam Neely will be a UAH graduate in December. He expects to march with a 4.0 GPA. Yet, he says he suffers from what he calls a paranoia. “(My) greatest fear has always been, always will be, failure,” Neely said. This feeling is so strong that the summer after his freshman year, he bought the accounting book for his sophomore year and outlined it, taking notes on every chapter. Neely started his internship with Phoenix in May and finished in July. He is a student in UAH’s College of Business Administration, and in the institution’s Executive Scholars Mentoring Program. Adam’s mentor is Donna Burger with Crabtree, Rowe & Burger. She put him in contact with Phoenix CEO Bryan Dodson, who put him in contact with Courtney Sweatman, Phoenix’s Director of Accounting. The 22-year-old Huntsville native made the most of his time at Phoenix. He was able to work in all three major areas: payroll, receivables, and payables. 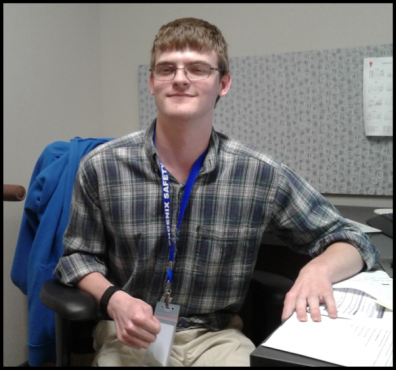 Adam was able to obtain his internship through a supported employment program funded by the state of Alabama. Several years ago, the supported employment program was on the brink of closing. However, Kathi Meikus devoted her time and resources to turning the program around making it a successful department putting many severely disabled employees to work and providing long term support to those individuals. Kathi Meikus began her employment with Phoenix in 2004. Before coming to Phoenix, Kathi worked at the Social Security Administration office for approximately 20 years and then she retired. Because she has such a love for helping others, specifically those with disabilities, she was easily persuaded to return back to the workforce and join the Phoenix team. Since 2004 she has aided in hundreds of individuals finding successful jobs and becoming productive members of society. Her passion truly shows through her work and, although she will be greatly missed, the Phoenix team wishes her all the best during her retirement.